Arsenal manager Arsene Wenger has continued to criticise Wales for playing Aaron Ramsey after their Euro 2016 qualification was already secured. The midfielder, 24, is out for up to a month with the hamstring injury he suffered against Bayern Munich. "Maybe he [Ramsey] was overloaded a little bit with games," Wenger said. "Ideally I think nor him, nor Gareth Bale should have played against Andorra because they were qualified, but unfortunately I could not decide that." The Football Association of Wales has declined to comment. Wales had secured their place at the Euro 2016 finals three days before playing Andorra on 13 October, with Israel's 2-1 defeat by Cyprus sending Chris Coleman's side through despite a 2-0 loss in Bosnia-Herzegovina. 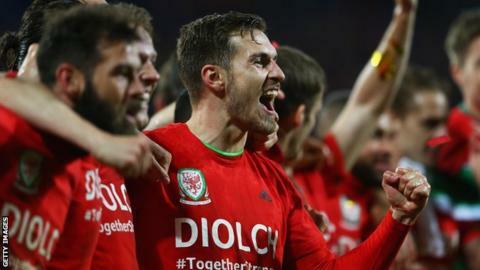 Ramsey and Bale both scored in the 2-0 win over Andorra in Cardiff as Wales celebrated their first appearance at a major finals since the 1958 World Cup. Wenger admits he had an opportunity to rest Ramsey in Arsenal's Premier League game against Watford on the Saturday following the Andorra game, but said that the Wales game was the ideal opportunity. "I was in a position after that I thought I could rest him against Watford, in the end I didn't do it," Wenger said. "And of course in front of Bayern I had not much choice and we got punished. "Ideally he should have had a breather at Watford, but realistically the real breather he could have had was against Andorra." Ramsey could miss Premier League games against Everton, Swansea and Tottenham, the League Cup fourth-round tie at Sheffield Wednesday, the return Champions League match at Bayern Munich, and Wales' friendly against the Netherlands on 13 November. Wenger revealed he had spoken to England manager Roy Hodgson on Theo Walcott, raising concerns about the forward playing on an artificial pitch in Lithuania. But the Arsenal boss said he had not called Coleman: "No, I cannot call every national coach after every game to ask him not to play the players. Wenger added: "It is a point of friction between clubs and national teams, but I understand. "When it's official games you do not want to interfere in that because the country is important and they have to win the games. "Once they play friendlies or games where there's nothing at stake you think they should accommodate the clubs as well."